This salad is one of my newest creations. 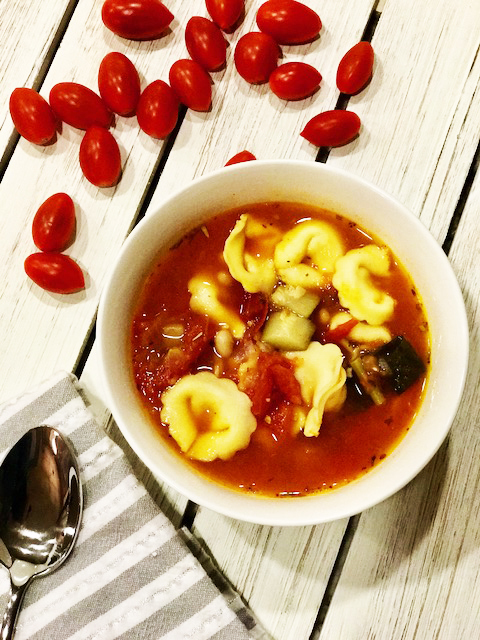 It’s really yummy and is great if you are trying to be low-carb or gluten-free! You can also switch up the ingredients to make it your own. 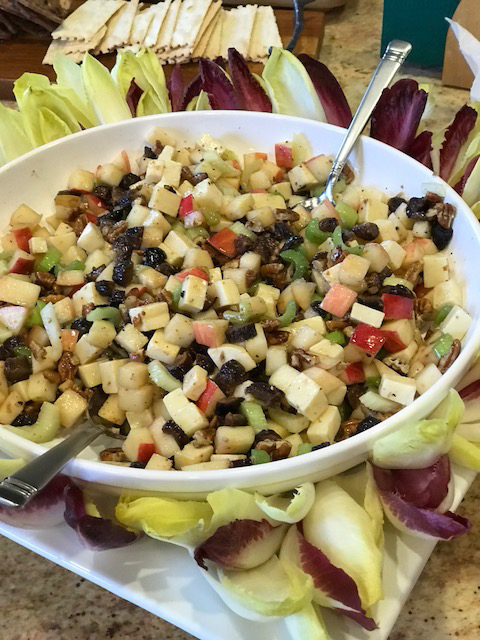 This is a great spring and summer salad that will wow guests and is great if you are trying to eat low-carb or gluten-free! Lemon Vinaigrette Dressing: Mix 1/2 cup olive oil, 3 tablespoons fresh lemon juice and zest of lemon, 1 1/2 teaspoons Dijon mustard, 1 tablespoon minced shallots, 1 garlic clove minced. Whisk together and refrigerate. Chop the apples and put lemon juice over them so they do not turn brown. Mix all the other ingredients into the bowl with the apples, and then mix the lemon vinaigrette in and serve. Thai noodle salad with almond butter is my newest creation. I make Thai noodle salad all the time and always switch up the different veggies I use. This time I decided to try it using chunky almond butter instead of peanut butter and it turned out great. Almond butter has less sugar and is healthier for you, but I still love the more traditional Thai noodle salad as well. This is a great option for people who are allergic to peanuts! I also used my favorite gluten free pasta by Ancient Harvest made with quinoa. You can usually find this pasta at any grocery store. Thai noodle salad is also great with shrimp, chicken or beef! Other vegetables that are great with this dish include, but are not limited to: asparagus, snow peas, cilantro, radish, and greens. 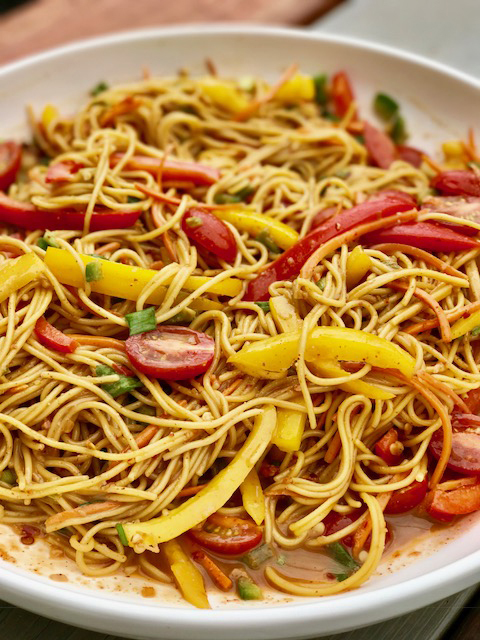 1 package spaghetti noodles You can use regular or Gluten Free noodles. Cook spaghetti noodles per package instructions and place in large bowl with a bit of sesame seed oil and stir, then set aside. Whisk together the Braggs Amino Acid or soy sauce with the almond butter, chili garlic sauce, ginger paste, sesame seed oil and honey. Add the vegetables into the pasta dish and then slowly add the almond butter mixture while stirring until the pasta is completely coated and mixed well. There will be left over sauce, so safe that and use it later if needed after the pasta has been refrigerated. Refrigerate for at least 30 minutes and serve. Use some of the left over sauce if needed. 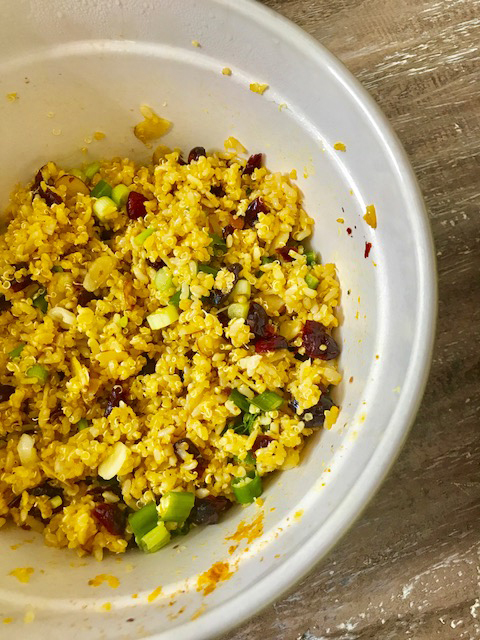 This Quinoa Curry Salad is one of my newest recipes I created. The curry flavor mixed with the sweetness of the cranberries and the tanginess of the lemon juice and zest all blend in together very nicely. Quinoa is one of my favorite go to’s because of the health benefits. Botanically Quinoa is not classified as a grain, although nutritionally it is considered a whole grain. Quinoa is naturally gluten-free and contains iron, B-vitamins, magnesium phosphorus, potassium, calcium, vitamin E, and fiber. It is one of only a few plant foods that are considered a complete protein, containing all nine essential amino acids. Most of the time I buy the organic quinoa in the frozen section at Trader Joe’s. 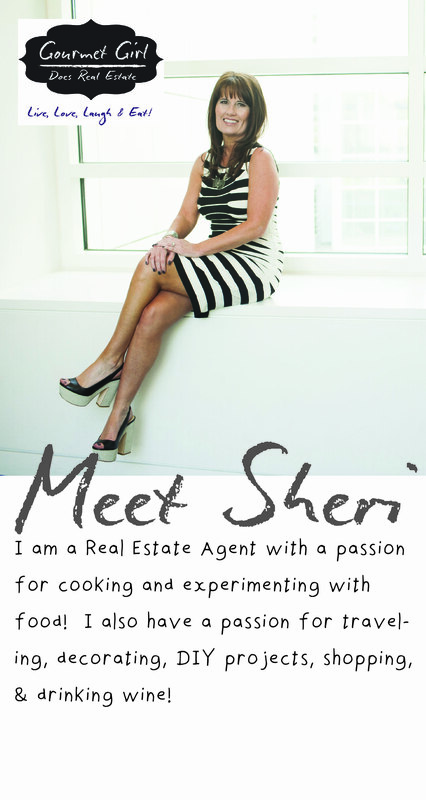 However, you can buy the kind you cook over the stove as well. 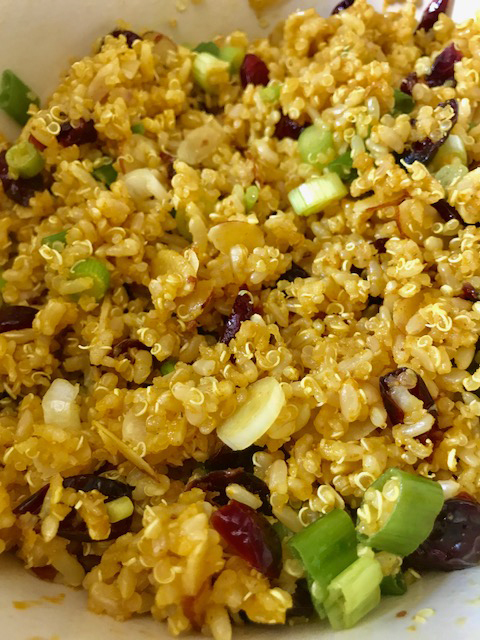 Quinoa Curry Salad with cranberries, sliced almonds, scallions, lemon juice, lemon zest, curry powder and olive oil. This salad goes great with any type of meat due to the complex flavors. 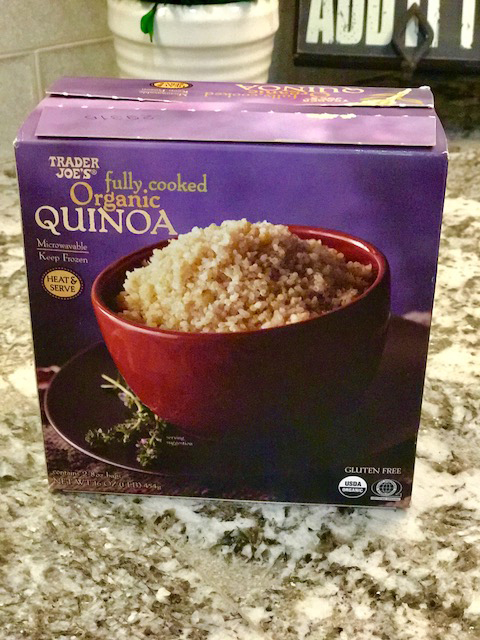 Heat up the Trader Joe's quinoa per package instructions, or cook other brand of quinoa per package instructions. Place quinoa in large bowl and let cool for at least 5 to 10 minutes. Add the juice and zest of both lemons as well as the curry and olive oil and stir. Then add the chopped scallions, dried cranberries and sliced almonds and mix well. 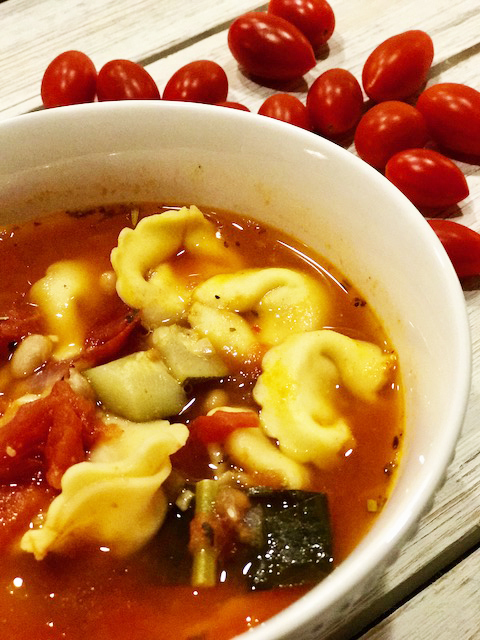 I always love to experiment with ravioli fillings. Last night I made this sweet potato and prosciutto ravioli, and I really loved it. I made a quick homemade white Alfredo sauce with fresh rosemary. The rosemary paired will with the sweet potatoes and prosciutto. The filling was very easy to make. 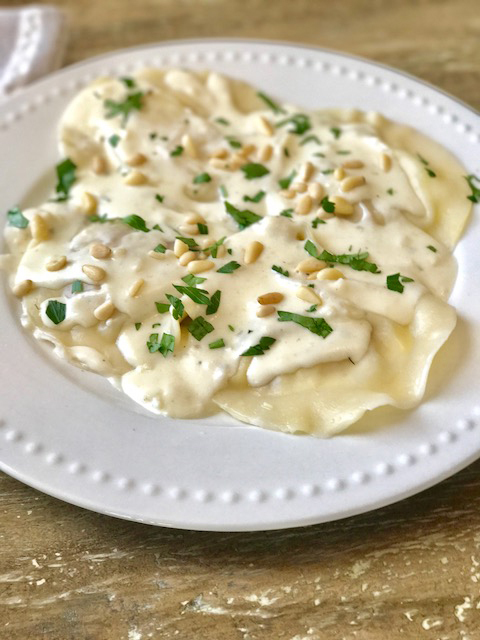 All you are doing is making mashed potatoes, but you don’t want to put the butter or cream/milk in it for a ravioli filling because it would be too moist. I love to make homemade dough for the raviolis when I have time, but using wonton wraps are easy when you don’t have as much time. 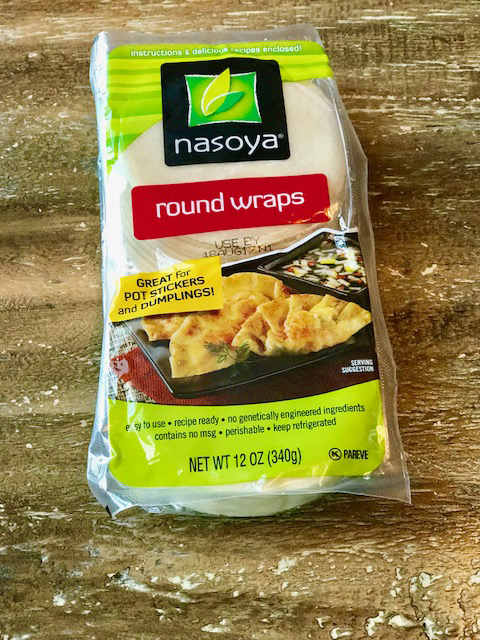 I like the round wonton wraps, but you can use the square ones too. 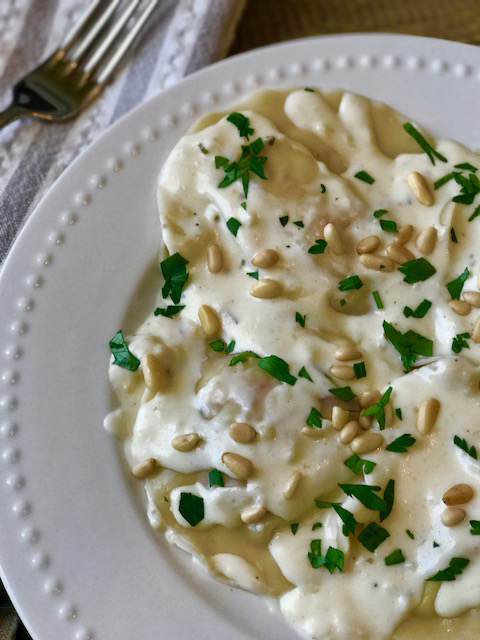 This Sweet Potato and Proscuitto Ravioli is sweet and savory! Cut the Prosciutto into small pieces and place in a skillet with a small amount of olive oil and cook on medium heat for approximately 10 minutes or until done. Place on a paper towel to soak up some of the oil and set aside. Peel the sweet potatoes and cut in half. Place the peeled potatoes in a big pot with water and a bit of salt and boil until potatoes are soft. Drain the potatoes and place in a large bowl. 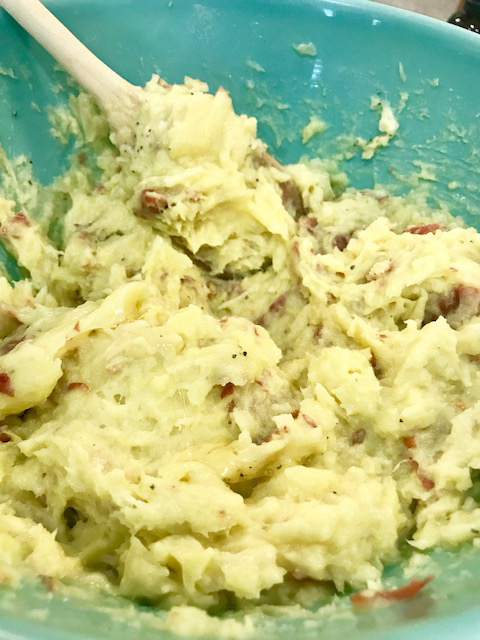 Use a masher to mash the potatoes. Add the cheese, Prosciutto, salt and pepper and mix well. then add 2 egg whites and mix. This will help bond the ravioli filling. 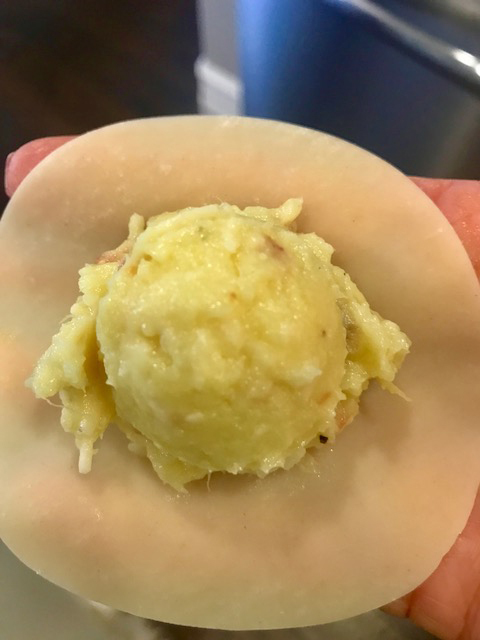 Use a round melon ball scooper or small spoon to scoop the ravioli filling and place it into the middle of the wonton wrap. Use a brush or your fingers to dab egg white around the edges of the wonton wrap and place another wonton wrap on top. Press the edges of the ravioli to ensure there are secure and that there are no bubbles. I like to place the raviolis in the freezer for a little before I cook them, but you do not have to do this step if you do not want to. In the meantime in a small to medium sauce pan, add the butter and melt on medium to medium low then add the flour to create a rue. Once you mix the flour and butter, add the milk, cheese, salt, pepper and rosemary. Cook on low heat for approximately 8 to 10 minutes. In a large pot, add water and salt and bring to a boil. Add the raviolis and cook until they float which is approximately 5 to 10 minutes. Be careful working with the wonton wrap raviolis because they are much thinner than regular ravioli dough. Once drained, plate the raviolis and add the Alfredo sauce. Top with pine nuts for garnish and added flavor. 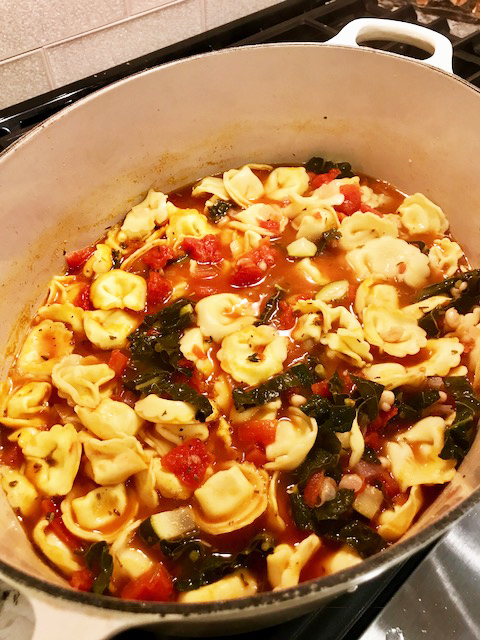 Chopped Italian parsley is also a great garnish for this dish. What do you do when it’s 100 degrees outside and you don’t want to use the grill? Stay in doors of course! Cooking at 200 degrees keeps the heat out of your house, and then you get ribs that just fall off the bone. 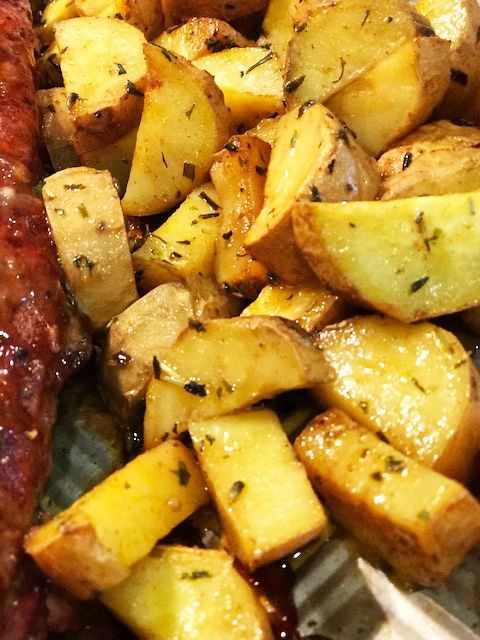 And what goes better with ribs than potatoes. I made rosemary sweet potatoes with my ribs last night. Sweet potatoes are my favorite because they are not as sweet at yams. And sweet potatoes stand up well in the over for a longer period of time because they are harder than yams or regular potatoes. I added a little chili olive oil in addition to the fresh rosemary just to experiment, and it tasted really good. Usually I will add cayenne pepper to my dry rub, but I skipped it this time since I added some chili olive oil. I didn’t want the potatoes to be overpowered by the heat. My husband was pleasantly surprised when he got home from work and ribs were waiting for him. Ribs are definitely one of his favorites. The best thing about slow cooked ribs is that the meat just falls off the bone. And as ribs go, pork ribs are the best! 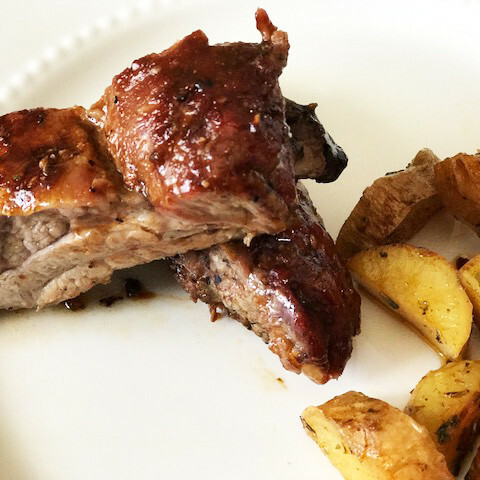 These slow cooked ribs are so easy to make, and they taste so good! Take the ribs out of the packaging and pat dry with a paper towel. Place ribs on a cooking sheet. Mix the sea salt, black pepper, chitpotle pepper, brown sugar, smoked paprika, garlic powder, Lowery's salt, and brown sugar in a bowl and mix well. Rub the mixed spices on both sides and then make sure the bone side is face down when you cook the ribs. Cut the sweet potatoes in cubes and place in a bowl. Mix the olive oils, freshly chopped rosemary and salt and pepper. 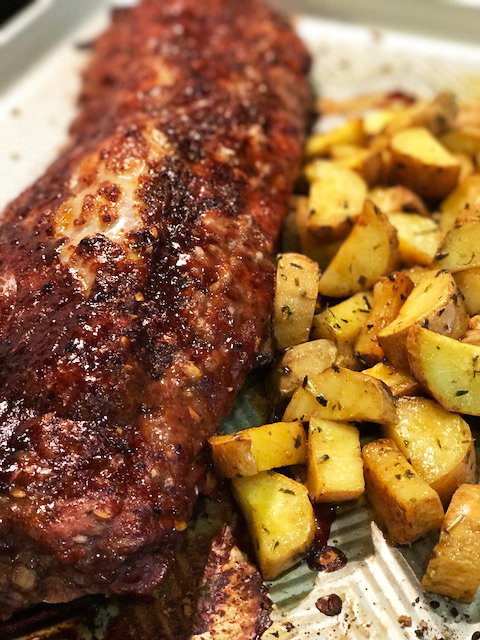 Place the potatoes on the cooking sheet with the ribs and place in oven. The ribs should take approximately 4 hours. The last hour baste some BBQ sauce on the ribs. 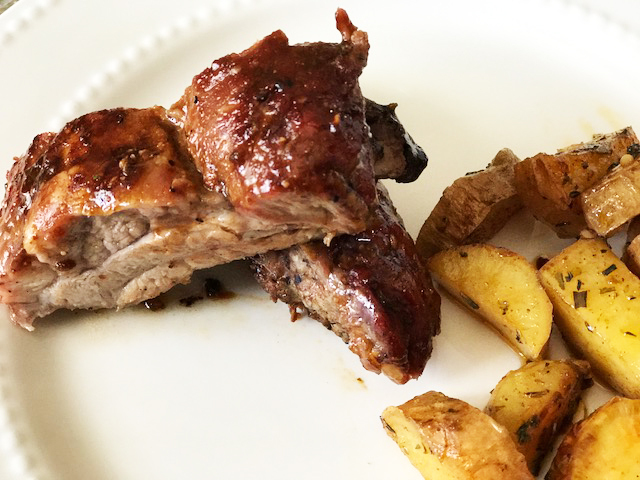 Note that the potatoes may be done sooner than the ribs, so make sure you are checking in on the ribs and potatoes every hour. Every year my husband and I go to Lake Arrowhead for the 4th of July weekend with our family. My sister-n-law has a beautiful house there overlooking the lake. We spend our time on the lake, but we also spend a fare amount of time cooking, eating, drinking and hanging out on the patio. I love to experiment with new foods together, so I came up the this yummy appetizer where I grilled peaches marinated in chocolate balsamic vinegar. 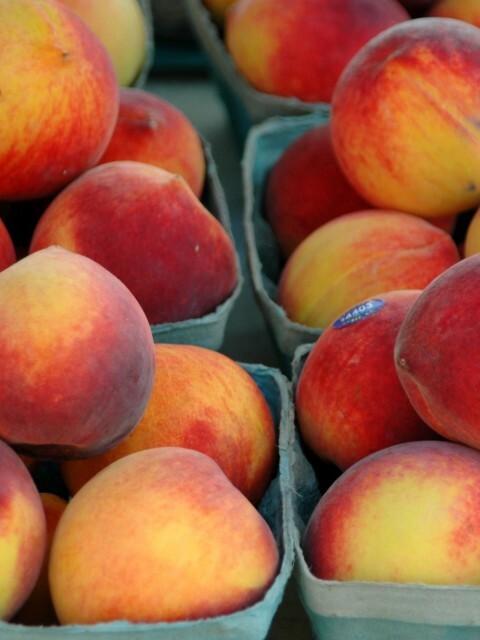 What can go wrong when you put fresh peaches in anything right? 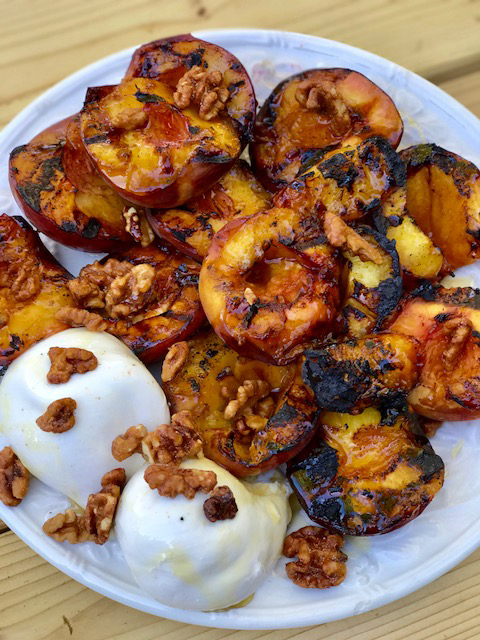 I served the grilled peaches with buratta cheese and candied pecans with a small amount of honey drizzled on top. I served it with some cranberry and pumpkin seed crackers, but you can pretty much serve this with any type of cracker and it would taste great! 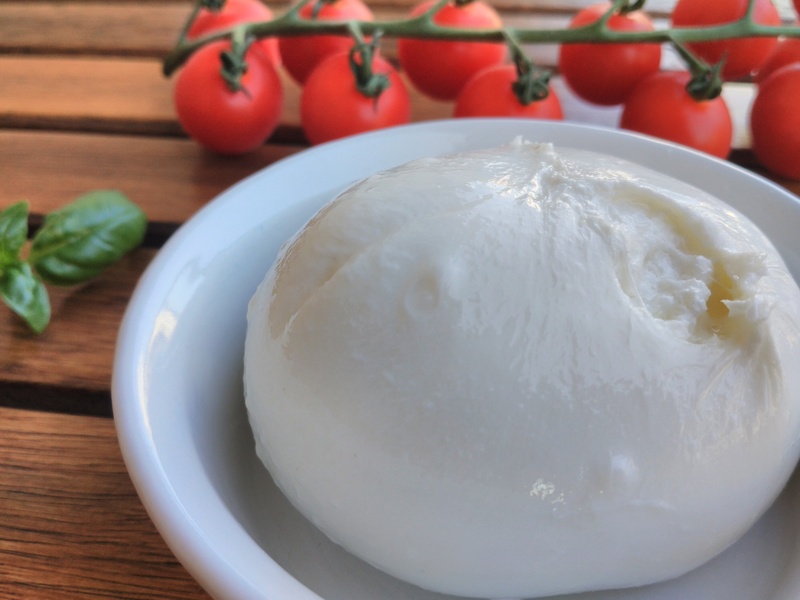 I love buratta cheese because it’s creamer than traditional mozzarella cheese and it has a richer flavor. If you have never tried it, I highly recommend it. I use it a lot when I make my Caprese salad as well. 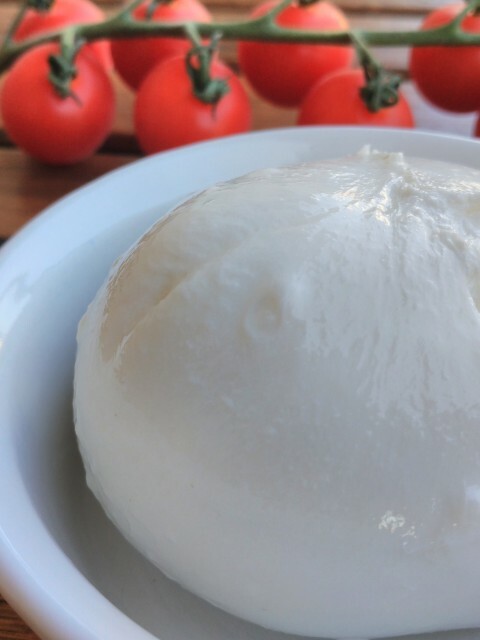 You can find buratta cheese in most stores, but if you cannot find it traditional mozzarella would taste great with this too. Or if you are feeling more adventurous you could also try ricotta cheese which I almost tried. I will save that for another time. 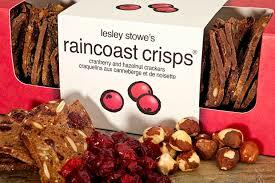 These raincoast crisps are one of my favorite crackers. This particular brand is harder to find, but you can usually find similar ones in most stores. Grilled Peaches are good without anything added to them at all, so just imagine yummy chocolate balsamic on them! 1 package candied pecans Or see my notes on how to make your own! Cut peaches in half and pit. 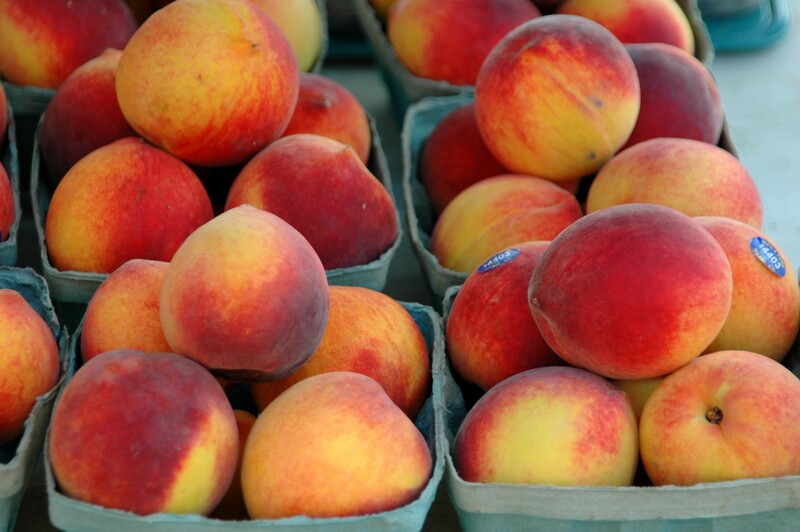 Place peaches in a bowl and pour the chocolate balsamic over it and mix well. Let soak for about 10 minutes or so. When the grill is ready grill the peaches on medium heat for approximately 15 minutes. Make sure to check frequently so that they don't get too mushy. When the peaches are done, take off grill and place on a platter. Add the buratta cheese to the platter, and then drizzle the honey and add the candied pecans. You can add the crackers to the platter or put in a separate dish. I have done them a few different ways using either regular refined white sugar, raw sugar and brown sugar. I have also made them with and without butter. If you don't use butter, using the refined sugar because it melts much better than brown sugar. All you do is add the pecans in a skillet at medium heat and sprinkle whatever sugar you want to use in the pan (usually about a cup). If you decide you want to use butter, add the butter first. I usually use about a tablespoon of butter for a full bag of pecans.